The university president Prof. Abu Zuhri welcomed the attendees and gave them an introductory presentation about the university, its faculties and specializations offered in doctoral, master's and bachelor's programs, assuring the University's policy of providing services and support to the local community, as its one of the most important objectives of the university. Pointing out that the university opens its doors to provide services to all segments of society, especially the marginalized of them. 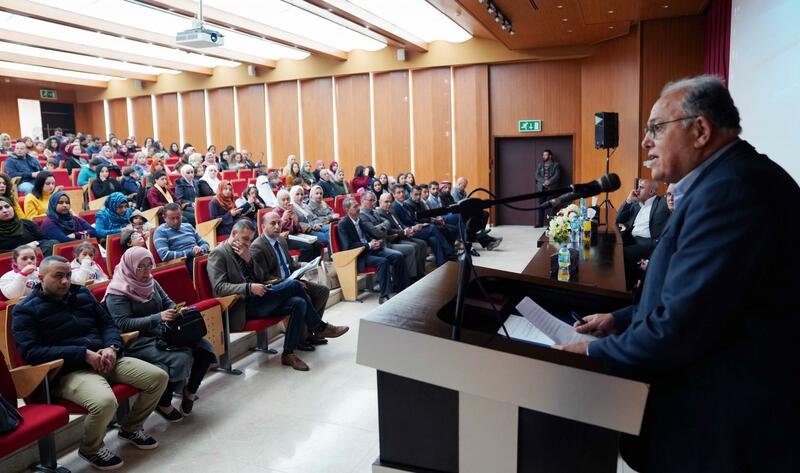 The Minister of Social Development Dr. Ibrahim Al-Shaer expressed his happiness to visit the university, thanking them for hosting special events of the community, assuring that the university has become and will remain an outstanding scientific edifice in the West Bank. After the meeting, the Minister of Social Development Dr. Ibrahim Al-Shaer took a tour around the university, its faculties and laboratories in the faculties of allied medical sciences and nursing. After that the workshop started, it was opened by the The university president Prof. Abu Zuhri, in his speech he assured the importance of Down Syndrome International Day. Noting that the international community celebrated this year under the slogan "Don’t leave anyone behind you," noting that the General Assembly of the United Nations issued in December 2011 a declaration recognizing March 21 as an International Day for Down Syndrome to be celebrated annually, to allow this category a decent life equally with its community in all aspects of life. 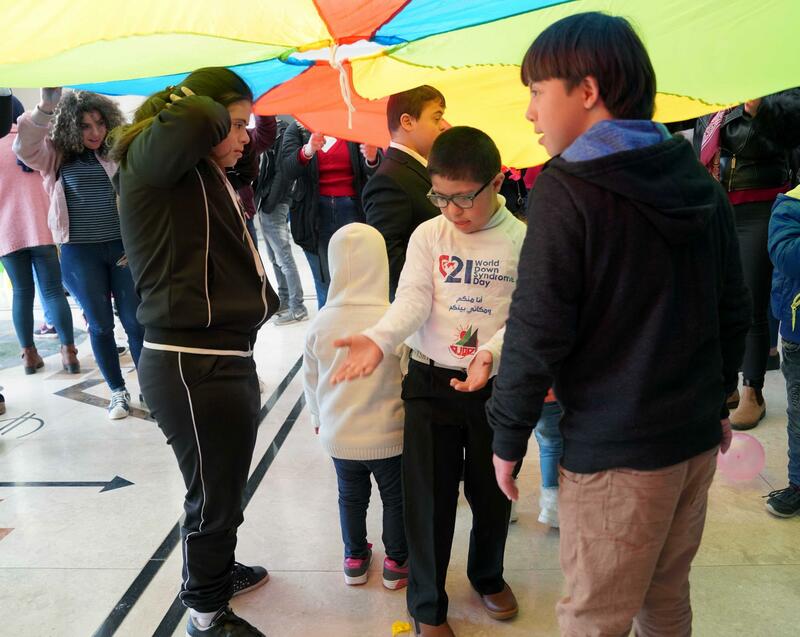 He pointed out that the number of people with Down syndrome is 1 out of 1000 person around the world, and every year about 3,000 to 5000 children are born with genetic disorder, explaining that this category has a lot of capabilities and achievements. 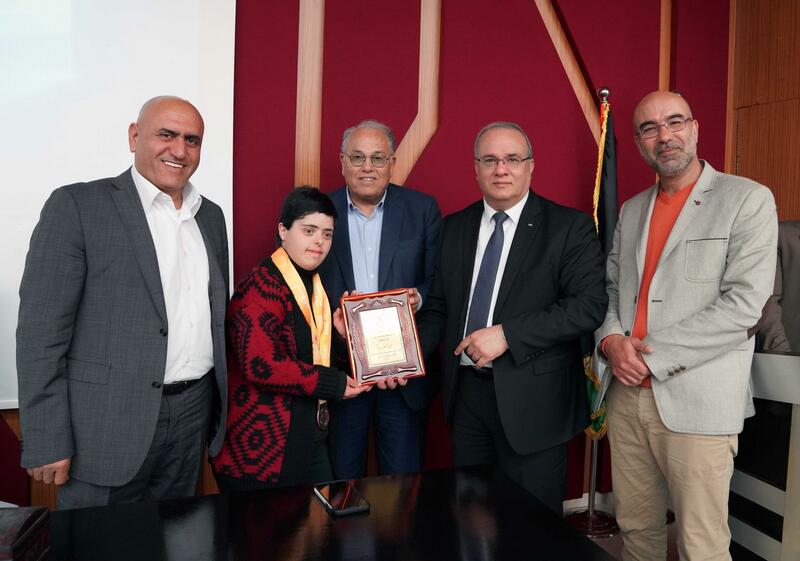 As in Palestine there is teacher Ms. Heba Shurafa from Gaza, she has achieved her dream to become the first teacher with Down Syndrome, and the Palestinian team that participated in the recent Olympics in Dubai have won the gold medals. Prof. Abu Zahri added, despite all the successes these people face many obstacles every day that requires concert efforts to overcome them, assuring the need to provide educational programs, motivated home environment, good health care and positive support from their family, friends and society to help children with Down syndrome develop their abilities and to live a decent life full of achievements. Minister of Social Development Dr. Ibrahim Al-Shaer announced that the ministry will establish support groups at governorates levels, in order to provide full care and support for people with Down Syndrome. Indicating the negligence faced by these people, but there is urgent efforts to develop tools including early diagnosis tools. He called upon all partners from government, NGOs and private institutions to cooperate and partner with the ministry in order to achieve the goal and to build a precise database of Down syndrome and raise awareness about their genetic excellence and their energies. He added, Despite of occupation Palestine was and will continue to send messages of good, and our message to this day is tenderness, love and hope. Pointing out that raising people with Down syndrome is difficult and needs exceptional support, thanking Down syndrome parents. 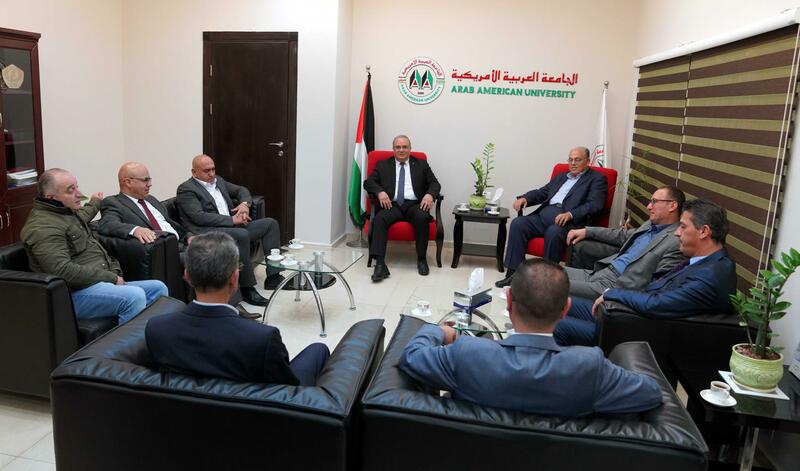 The governor of Jenin governorate Major General Akram Rajoub called on all Palestinian factions and institutions to provide exceptional attention to this category in order to raise them for the better. He pointed out the need to pay attention to employ people with special needs according to the Palestinian law. Thanking AAUP for this special event. 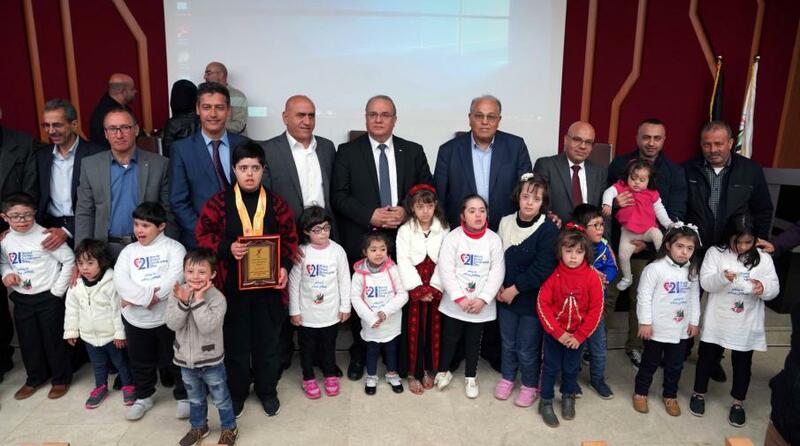 The Director of Al-Rahim Society Friends of Down Syndrome Mr. Haider Abu Makho said that the society is the first and only association in the West Bank specialized in the rehabilitation and providing various services for this marginalized group in the community. He pointed out that there are in Palestine 3,500 children with Down's syndrome and more than 50 of them in schools, assuring that this group is able to develop and become an active member in the society. 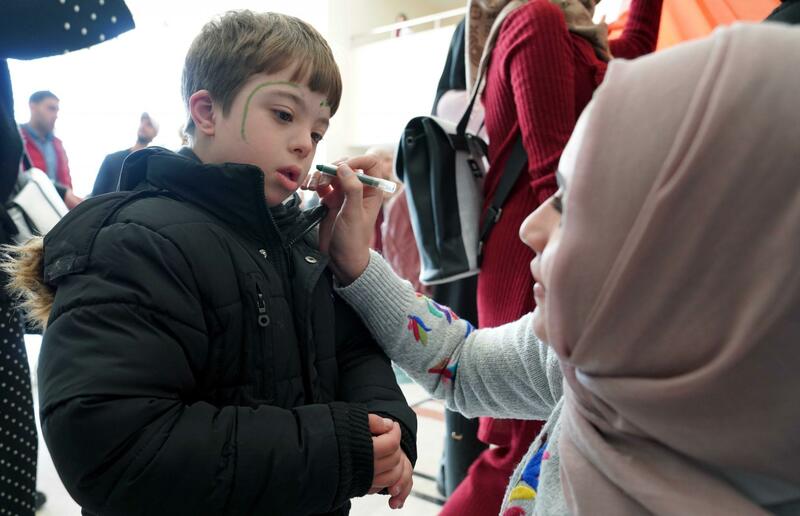 The activities included many art shows and games in which children with Down syndrome and their families participated in, as students from physio therapy, occupational therapy and nursing also participate in these activities.